Local innovation rather than the expansion of the population is the reason behind the appearance of new technologies in Eurasia over 300,000 years ago. The analysis of artefacts from a 325,000-year-old-site in Armenia exposes that human technological innovation occurred intermittently throughout the Old World, rather than spreading from a single point of origin, as was previously considered. The study, published yesterday in the journal Science, examines thousands of stone artefacts collected from Nor Geghi 1, a unique site preserved between two lava flows dated to 200,000-400,000 years ago. Layers of the floodplain sediments and an ancient soil discovered between these lava flows contain the archaeological material. The dating of volcanic ash uncovered within the sediments and detailed study of the sediments themselves allowed researchers to correlate the stone tools with a period between 325,000 and 335,000 years ago when the Earth’s climate was similar to that of today’s. The stone tools supply early evidence for the simultaneous use of two distinct technologies: biface technology, often associated with hand axe production during the Lower Palaeolithic, and Levallois technology, a stone tool production method usually attributed to the Middle Stone Age in Africa and the Middle Palaeolithic in Eurasia. 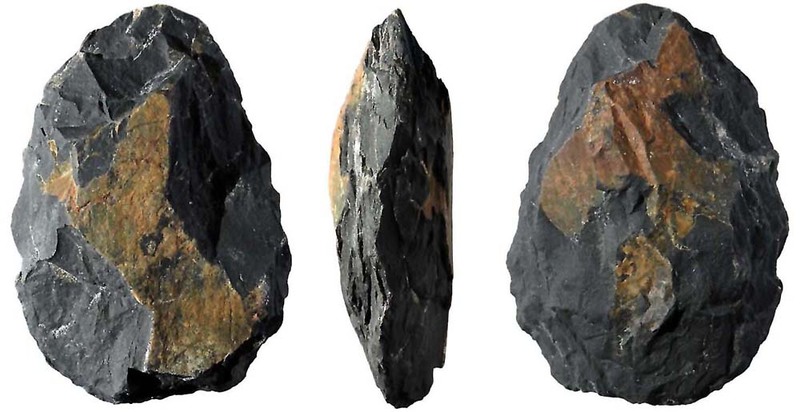 Traditionally, archaeologists use the development of the Levallois technology and the disappearance of biface technology to distinguish the transition from the Lower to the Middle Palaeolithic approximately 300,000 years ago. Archaeologists have argued that Levallois technology was invented in Africa and spread to Eurasia with expanding human populations, replacing the local biface technologies along the way. This theory draws a link between populations and technologies and therefore equates technological change with a demographic change. The co-existence of the two technologies at Nor Geghi 1 provides the first sure evidence that local populations developed Levallois technology out of existing biface technology. “The combination of these different technologies in one place suggests to us that, about 325,000 years ago, people at the site were innovative,” says Daniel Adler, associate professor of Anthropology at the University of Connecticut, and the study’s lead author. What is more, the chemical analysis of several hundred obsidian artefacts shoes that humans at the site utilised obsidian outcrops from as far away as 120 kilometres (about 75 miles), inferring they must also have been capable of exploiting large, environmentally diverse territories. The paper initiates the argument that biface and Levallois technology, while distinct in numerous regards, share a common lineage. In biface technology, a mass of stone is shaped via the removal of flakes from two surfaces in order to produce a tool such as a hand axe. The flakes that are detached through the manufacture of a biface are treated as waste material. In Levallois technology, a mass of stone is shaped through, once again, the removal of flakes but this time to create a convex surface from which the flakes of predetermined size are detached. The predetermined flakes produced through Levallois technology are the desired products. Archaeologists imply that Levallois technology is most favourable in terms of raw material use and that the predetermined flakes are small and easy to carry. These were essential issues for the highly mobile hunter-gatherers of the time. It is the innovative combination of the shaping and flaking systems that distinguishes Levallois from the other technologies, and highlights its evolutionary relationship to biface technology. Based on comparisons of archaeological data collected from sites located in Africa, the Middle East, and Europe, the study also shows that this evolution was gradual and intermittent, and that it occurred independently within different human populations who shared a common technological ancestry, says Adler. In other words, Levallois technology evolved from the pre-existing biface technology in different locations and at different times. The conclusion this study draws challenges the view held by some archaeologists that technological change was a direct result of population change during the period. “If I were to take all the artefacts from the site and show them to an archaeologist, they would immediately begin to categorise them into chronologically distinct groups”, Adler said. In reality, the artefacts discovered at Nor Geghi 1 reflect the technological flexibility and variability of a single population during a period of intense human behavioural and biological change. These results highlight the antiquity of the human capacity for innovation.